Werner Gourmet Meat Snacks is a manufacturer of beef jerky, based out of Tillamook, OR. They've been in business since 1994. 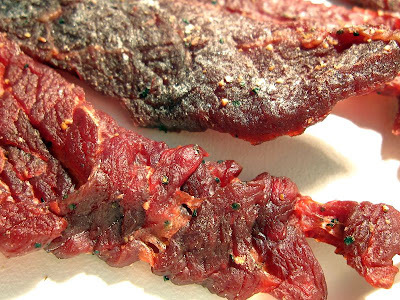 The company makes beef jerky in their own USDA approved facility. Werner is also well known as a private labeler making beef jerky for other brands like Branding Iron, and Shalhoob Meat Co. 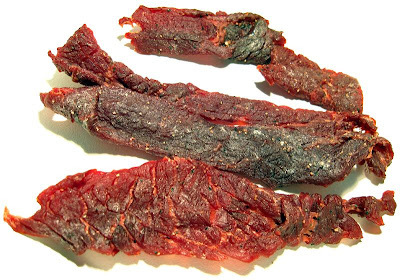 In addition to this whole muscle beef jerky, they also offer kippered beef steak, meat sticks, and chopped & formed. Beef, water, salt, hydrolyzed soy and/or corn protein, worcestershire sauce, flavorings, sodium nitrite. The first thing I taste from the surface of these pieces is a strong worcestershire sauce flavor, followed by a saltiness, and a light smoky flavor as well. In the chewing, I get a more defined worcestershire sauce flavor, and some black pepper flavor. My first impression with this jerky is that it has a good deal of flavor intensity, mostly from that worcestershire, salt, and black pepper. In fact, I'd say the primary flavor of this jerky is the worcestershire sauce. I can taste it from the surface, and in the chewing the flavor becomes more clearly defined as worcestershire. The saltiness is also a strong flavor, and I'd rate its intensity level as high, but not "too high" to where it becomes intolerable. The black pepper is something I notice more in the chewing. It's not a dominant flavor, but it clearly colors the overall flavor, and it matches up well with the worcestershire, giving it a little more contrast and bite. There's a noticeable garlic flavor as well, but it appears to be part of the worcestershire. Overall, what you're going to taste in this jerky is a strong worcestershire sauce flavor, albeit more salty than standard worcestershire, with some added black pepper. These appear to be slices of whole meat, sliced to a medium thickness, and in strips of about 2 to 6 inches in length. This is a dry jerky, but having a fair amount of flexibility before cracking. These strips bite off fairly easily, and they seem to chew easily as well. The chewing texture starts out feeling soft and pliable, it doesn't take much sucking and light biting before it softens and breaks apart. It chews down to a soft mass in about 15-20 seconds. At that point, it takes on a steak-like texture, very much like a medium-cooked steak. It doesn't feel mushy, gummy, or crumbly at all. I do see small bits of fat on some strips, and all of the strips seemed to contain some chewy sinews. I did find one strip with a decent sized piece of tendon. But no gristle to be found. They also seem to eat very cleanly, leaving no fragments of meat on my lap or desk, and no residue on my fingertips. I paid $12.99 for this six ounce package at a Sol Foods store in Springdale, UT. That works out to a price of $2.17 per ounce. Note that you can also purchase this online directly from Werner at almost a $1.00 per ounce, not counting shipping. For general jerky snacking purposes, at the $2.17 price per ounce, this seems to present a good value. I'm getting a good deal of snackability from its good overall flavor, good flavor intensity, easy eating, and good chewing texture. The price I paid at the food store seems high, but I do in fact get quite a bit of snackability in return. This Original variety from Werner Gourmet Meat Snacks presents a good overall flavor, as a strong worcestershire flavor, with extra salt, and some black pepper. The garlic in the worcestershire is quite noticeable. Add to that flavor with an easy to eat consistency, and good chewing texture, and it creates a lot of snackability. What I see as the biggest negative is that it doesn't offer any natural meat flavors. I would love to get some meat flavor with that worcestershire, black pepper, and garlic. Even though the overall flavor of this jerky is pretty good, it still doesn't quite breach the "best" rating when I compare it against the 120+ other brands, and 300+ varieties, I've reviewed thus far. But it's still pretty good, especially if you like saltier jerky, and if you can buy this online from Werner at a price per ounce of $1.50 or less, I'd highly recommend it. My recommended beer pairing for this, try a smooth creamy stout.